Takeaway: If your local grocery store is always out of certain produce that can be grown hydroponically, there might be an opportunity to fill that niche. Do your due diligence, and you just might end up with a cash crop. Growing any kind of vegetable or food crop hydroponically for yourself or family is great. You get to have the pride of eating food that you grew yourself, controlling all of its inputs. If you start to think, though, that you would like to branch out and start growing food for sale, it is important to be a bit more selective about what you grow. Hydroponic greens are common in most marketplaces. They are a staple of hydro production and chances are, you will not be able to compete in the marketplace if there are already established hydroponic growers already filling that niche. There are, however, several other crops that can be grown hydroponically and provide a much greater return than lettuce or greens. Before setting out to grow any hydro crop for profit, it is important to perform a market analysis. Visit farmers’ markets, local grocery stores, and any place where folks who care about the source of their food go to shop. This will tell you what is being grown and what you can expect to charge. This varies greatly from region to region, and it should not be assumed that because one crop is profitable in one area, it will be in another. The crop should be one that cannot be grown year-round in your particular region with conventional field production. It should also be apparent that the quality of the hydroponically grown crop is at least as good, if not better, than its field-grown counterpart. As a quick aside, though some may argue that any crop can be grown hydroponically, it doesn’t mean that it should be. It will probably not be profitable to grow root vegetables such as carrots, radishes, turnips, potatoes, etc. These do not often do well hydroponically and even if you find a method that allows for successful growth, you will not likely compete with conventional or even organic growers that produce those crops in the soil. Most root crops also store well, meaning that they are available locally, sometimes even months after they were harvested. Crops that are heavy or require cumbersome trellising systems should probably be avoided. Jack-O-Lantern pumpkins, for instance, are probably not going to represent a good return on investment for you if you try to grow them hydroponically. The same goes for fruit-bearing trees and shrubs. Again, this is not to say that under the right circumstances these crops cannot be grown successfully, it is just doubtful that they could be done so profitably on any commercial scale. The following three crops can, however, be grown hydroponically and should represent a profit opportunity in most markets if grown consistently of high quality. Again, it should be reiterated, that if one or more of these crops is already being successfully grown hydroponically in your particular area, you may have to find your own niche. Mushrooms are a lucrative crop no matter how they are grown, but grow them hydroponically and you really can set yourself apart from your competitors. Mushrooms, of course, are not plants with roots per se, but they nonetheless can be grown “hydroponically” if we use the term loosely. They are grown in a soilless media and require moisture. They can be grown with ready-to-use kit or by creating your own mycelia. Unlike other indoor grown crops, they do not need much light and do not, in fact, even use light for anything other than a trigger to start fruiting as they do not photosynthesize. The easiest way to start out is to obtain a kit that already contains colonized media such as compressed sawdust, hulls, or hardwood shavings. Remove this kit from its packaging and submerge in a bucket of water for six to 12 hours, making sure it is fully saturated. Then place the saturated brick in a dark area with a temperature between 60-75°F (15-24°C) until it starts to produce (this will take several weeks). After harvesting the full flush of your mushroom crop, re-submerge it again for six to 12 hours and repeat. Most commercially available mushroom kits will have between two and four flushes of mushrooms. If this method works and it gets you excited about growing mushrooms, you may wish to try the whole process yourself. Mushroom spawn is commercially available. You will need to put it in a sterile petri dish to form mycelia. After it has done so, mix the mycelia in a clear container with sterile grain such as rye or rice. This is the food source for the developing mushrooms while it colonizes. Once it has colonized (it will appear white and have surrounded the grain substrate), mix vermiculite and the mycelia with a little water until it has a clay-like consistency. Create “cakes” with this mix. Place these cakes into a hydro tank with an air stone and clay pebbles. The cakes should sit atop the clay and not float, but there should be enough oxygenated water to circulate just beneath the surface. Make sure the temperature of the water remains above 60°F (15°C); use a heater if necessary. With either method, there is no real waste. The spent block or the cakes can be put into a compost pile or added to mulch in the garden. 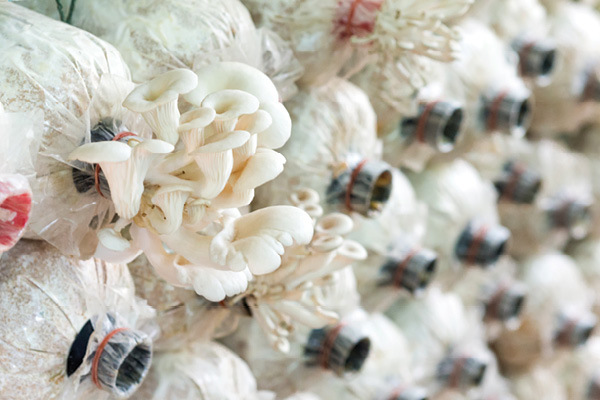 In some instances, there will still be occasional, random mushrooms that appear and can be harvested from the used media. Fruit is always a hit at farmers’ markets and when fruit is in season, many grocery stores can’t keep up with the demand. 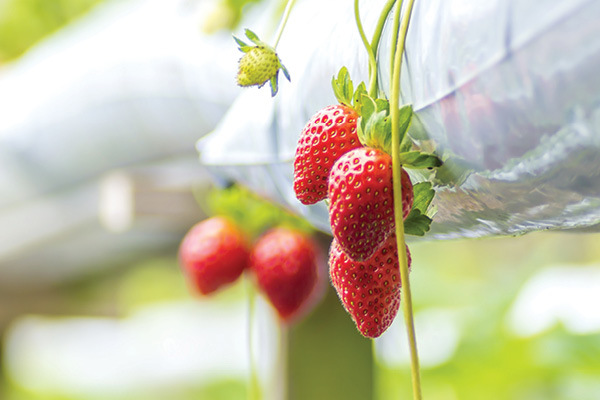 By growing strawberries with hydroponics, you can have a market advantage if not all year, then at least for the 10 or so months per year when conventionally grown ones do not dominate the market. 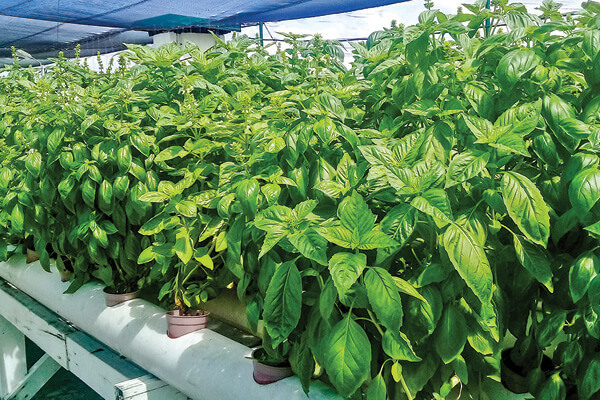 Reported yields from hydroponic growers range from being less than field-grown types to being up to four times more prolific. These wide ranges can be accounted for largely with the type of strawberry grown. Some are better suited for hydroponic growth than others, so make sure to do a little research on varieties before buying. Red Gauntlet is a variety that some indoor growers have had great success with. Besides being able to control climatic variables and the lack (usually) of soil-borne pests, the other benefit to growing hydroponic strawberries is that they can be grown vertically, several plants high. Even if each individual plant were not to yield as many pints as its field-grown counterpart, there would be several plants growing in the same footprint of space, which could easily out-yield traditionally grown strawberries. Hydroponic strawberries do best when temperatures do not fluctuate much outside of the high 50s for nighttime lows and the low 70s for daytime highs (14-22°C). The pH of the nutrient film or reservoir water should be between 6-6.5, with an EC of 2-3. For optimal sweetness (and sales appeal), pick strawberries in the morning; they lose some of their sweetness profile throughout the course of the day. Herbs are a great cash crop. Not all herbs can be grown well hydroponically, but basil certainly can be. Basil is sensitive to cold climates, so growing it with hydroponics makes sense as it, like strawberries, is usually only available for a few months per year if grown conventionally in soil. It can also fetch a high dollar amount per pound as compared to most other crops. Fresh basil also has the advantage of being coveted by many chefs at higher end restaurants. As you will likely be able to sell many pounds of it on a regular basis to several area restaurants or institutions like schools’ or universities’ dining departments, you may be able to avoid having to sell it a few ounces at a time to farmers’ market customers (not that it isn’t worth it, as you will make more money per pound). Hydroponic basil has the added advantage of packing more flavor. This has been quantified by several university-led studies showing that it contains 20-40 per cent more oils than field-grown basil. By growing several different types of basil (there are well over 100), you can diversify your market as well. There are giant-leafed basils, variegated-leafed basils, and ones that run the gamut of flavor and texture. Some types of basil such as African Blue and Thai, if allowed to go to flower make excellent additions to cut flower bouquets or can be sold in their own right as cut flowers. Basil grows best in an NFT set-up as opposed to a drip. They like it on the warm side; maintain temperatures in the range of 70-75°F (21-24°C) with 40-60 per cent humidity. They like lots of light, so make sure to give them as much natural light, as well as artificial light with as much spectrum, as possible. The pH range for hydro basil should be about 5.8-6.4 and the EC should be 1-2. So, there you have it—three hydroponic crops that could be lucrative. Just be sure to do your market research before you grow so you don’t end up with a bunch of wonderful produce you can’t sell.